Great art from several of the best artists in sequential art. Pat Mills returns to iconic stories. Longtime fans will get more out of Mills story. Slaine, a barbarian fantasy series which takes in various elements of Irish and Celtic mythology, created by Pat Mills and Angela Kincaid, recently had its 30th anniversary. In celebration of this, The Book of Scars finds Slaine catapulted back through time by his long time foe Guledig to some of the landmark battles of his lifetime. Only this time, his foes have been told of Slaine’s previous victory and are prepared. 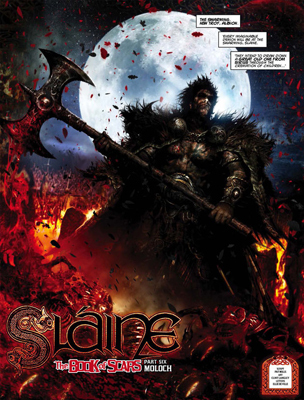 Slaine has, over the years, firmly established himself as one of the most popular characters to emerge from the seminal British anthology comic 2000AD. A thinking man’s take on the barbarian fantasy popularised by Robert E. Howard’s Conan, The Book of Scars is in essence a ‘best of,’ as several artists responsible for depictions of classic stories in the characters history return to their previous work in a six part story, with writer Pat Mills adding a distinct twist to things. 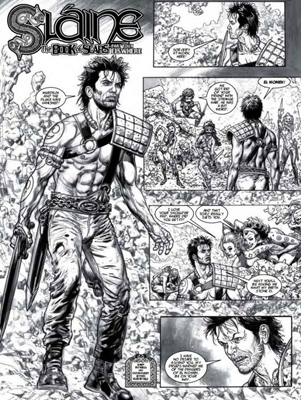 Glenn Fabry’s return to Slaine after over a decade. One of the inherent appeals of Slaine, and its parent title 2000AD. is the variety that always presents itself, the art styles of Simon Bisley and Clint Langley are distinctly different, but both are responsible for classic stories: Bisley works on the story The Horned God, which stood out with its lush painted art, and Langley drew the characters’ recent ascendence with The Books of Invasions, where his eye popping digital art brought life to the Fomorians in a way never seen before. Elsewhere, Mike McMahon, the artist for Sky Chariots, returns alongside another artist whose work on Slaine was one of his first real art jobs, Glenn Fabry, a name now synonymous with the best covers in comics on Garth Ennis’ Preacher. Clint Langley also pays a fitting tribute to artist Massimo Belardinelli, who had the unenviable task of visualising Slaine’s infamous ‘Warp spasm’ for the first time in the story The Bride of Crom. For most of these artists, it’s their first work on Slaine in over a decade if not more. Pat Mills biggest accomplishment with Slaine was incorporating real mythology into the various stories. Slaine himself is inspired by Cú Chulainn, amongst others, the Irish folk hero who wielded the power of the Earth to warp his body into a monstrously powerful form, and appears in the Ulster Cycle of Irish mythology. Slaine fights to protect the realm of Tir Nan Og in the name Danu, the Earth goddess and amongst others his enemies are the Fomorians. The inquisitive and the curious can research the real myths behind numerous characters, gods and goddesses which appear in Slaine. Recent artist Clint Langley’s recognisible digital painting. Having several of the best artists working in comics featured in the same book is quite a feat to pull off, and fans will no doubt have their favourite dependent on when they first discovered the character. The best thing, of course, is seeing that already skilled artists have improved over the years: Bisley’s work in particular is more refined than his work on The Horned God, and those only familiar will Fabry through his covers will be surprised to see his crisp and instantly recognisable style rendered in black and white panels. Langley’s take on Bride of Crom features several stunning images like Lord Weird Slough Feg and his cadaverous soldiers, and Slaine enduring a warp spasm these are just a couple of numerous memorable images. As for Pat Mills story, long-time fans will benefit more from revisiting Slaine’s past, picking up on the various changes that have been wrought by Guledig’s interference. The Book of Scars, though, isn’t just a story, it’s an encyclopedia, as, along with the story, it also features The Art of Slaine, a gallery featuring every 2000AD cover Slaine has appeared on, from his first appearance way back on the cover of prog 330 in 1983, to his most recent prog 1849 this year. Along with the art, though, is commentary from various 2000AD contributors over the years: Pat Mills, Clint Langley, Garth Ennis, Angela Kincaid, Mike McMahon, Jock, John Higgins, Colin McNeil, Henry Flint, Glenn Fabry, and more besides. As with all Rebellion’s recent hardback editions, this is a well-produced and glossy affair more at home on the coffee table than the book shelf.